On Wednesday, Microsoft released Windows 10 Build 10041, which aims to address one of the more confusing aspects of Windows 10: the virtual desktop. Microsoft’s new build also offers up a new, transparent Start menu; a “text input” canvas for penning text into a Windows 10 tablet; and smaller improvements, including another upgrade to the Photos app, new Lock screen upgrades, and tweaks to the Windows Insider program that “gamify” the feedback process and allow you to even win prizes. A new Windows build for phones is en route, but Microsoft “still needs a bit more time for that one,” Brandon LeBlanc of Microsoft wrote Wednesday. Microsoft’s new build is its first since January's Build 9926. That release featured the debut of Microsoft’s digital assistant, Cortana, on the Windows desktop. With the new build, Cortana has now voyaged to China, the UK, France, Italy, Germany, and Spain, Microsoft said. Why this matters: Windows 10 builds are a grab bag of new features. But in my mind, one of the more challenging is the virtual desktop, the “poor man’s multimonitor” solution. With virtual desktops, you can create collections of apps that are arranged the way that you want, so you can quickly step through multiple screens of apps on a single monitor. But once you’ve created them, moving data back and forth between them can be tricky. Previously, if you wanted to move data between virtual desktops, you had to right-click and select it, then select the desktop to move it to. In Build 10041, you can click a “+” button and move the window to a new desktop in a single step. Another handy feature: a filtered taskbar option, so that only the tasks you have set up in a virtual desktop will show up in the taskbar. The new build 10041 features better handwriting input with predictive capabilities. Microsoft has worked to show you archived photos stored on OneDrive inside the app itself. Now that functionality has moved to the corresponding live tile. Microsoft also added support for photos stored in the RAW format, and added keyboard shortcuts (tab, up and down arrow) as well. If you’re the type to enter handwritten text from a stylus, Microsoft said, the new build will begin to “auto suggest” text as you’re writing it, showing off its real-time character recognition. 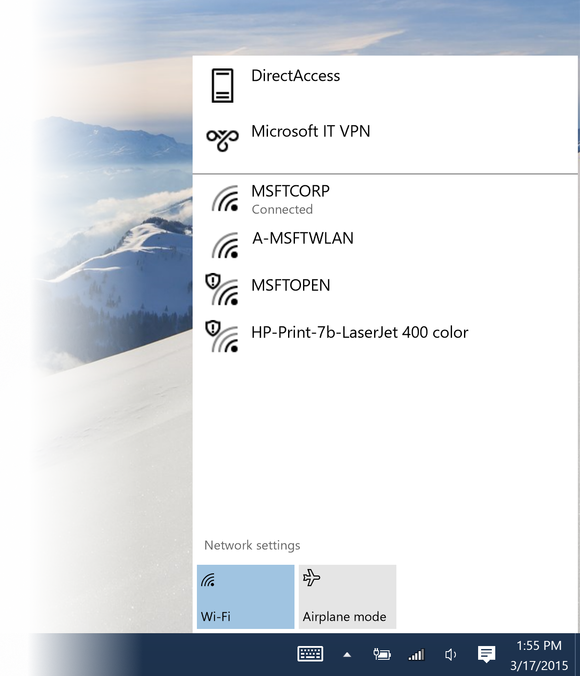 Finally, there’s a new “fly-out” experience from the Network icon, for quick access to the network settings. The new Networking fly-out from the taskbar. You might not think of lock-screen messages and the Windows Feedback app as something that most users would find all that useful. 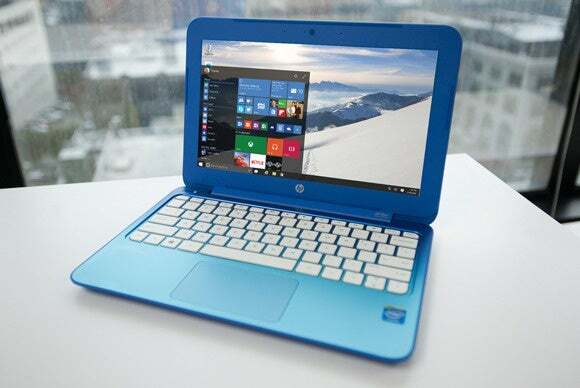 But it’s one of Microsoft’s most valuable tools for tapping into you, the Windows 10 beta testers. Windows 10 will occasionally ask you for feedback on completing a particular task, as Microsoft peers over your shoulder—one reason you might not want to use the Windows 10 technical preview as your production machine. With Build 10041, Microsoft will start placing tips and tricks on the Start screen, as well as continue the varied nature imagery it taps Bing to provide. Inside the build itself, Microsoft will begin showing you how good of a beta tester you really are: how many missions (tasks) you’ve completed, how often you’ve responded to requests for feedback, how much feedback you’ve submitted, and the number of up-votes your feedback has received. There will even be opportunities for prizes, Microsoft says. Microsoft also made a few tweaks to the Start menu, allowing you to pin frequently used apps to the Start menu. The Start menu is now semi-transparent, coming more in line with the Windows 10 for phones experience. In 9926 there were several issues which prevented Start from launching; these should all be fixed. The search box now works if you have taskbar on the top/side of your screen. After installing the last build (9926), you may have seen a boot selection menu when you rebooted your PC. Microsoft has fixed this, and you should no longer see the boot selection menu, unless you’re intentionally dual-booting. Microsoft received feedback that people were seeing persistent grey thumbnails in the Collection view in the Photos app on Build 9926, and fixed that. The username and password boxes may not appear or don’t accept input when logging in, which will prevent users from logging in. Microsoft said that workarounds include clicking the “Switch User” button, using Ctrl+Alt+Del, or pressing the power button on your PC to sleep/resume and try again. It is possible to manually lock your PC during the initial out-of-box experience. If you do this, you will have to hard reboot your PC and restart the OOBE experience. So don’t do it! In this build, the Mail, Calendar, and People apps may be broken due to a licensing issue with the Store Beta. A fix is available here, in the “known issues” section. Some apps in the Store won’t work due to licensing issues. What do you think of the new build? Let us know in the comments below!